Whether you’re new to WordPress or have been using the platform for years there are a number of things you can do to help improve the effectiveness and SEO performance of your website. And while WordPress is an SEO friendly platform in order for you to realise the full potential of your website you need to make sure that it is setup correctly. In this article we’ll take you through the steps you’ll need to take to help setup your website for SEO success. 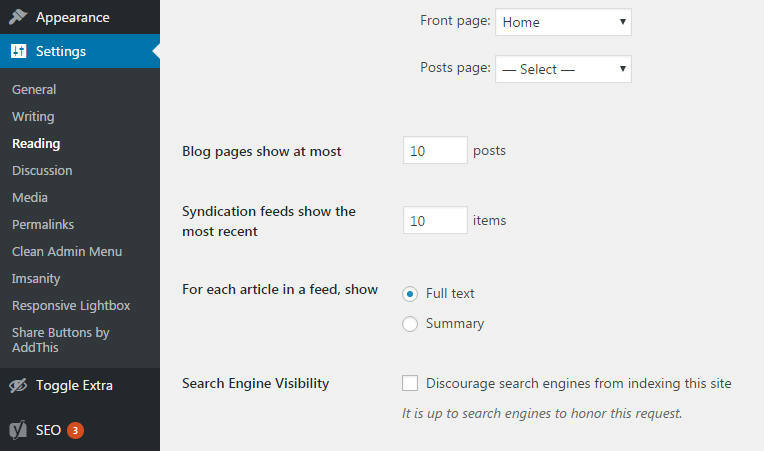 One of the first steps and probably the most important is to check your website’s visibility settings as WordPress has an option to hide your website from the search engines. If you’ve just had a new site developed then this is one of the first things to check as from a development point of view this option may have been left checked. Now that your website is visible to the search engines and has an SEO friendly URL structure it’s time to install an SEO plugin to take your optimisation to the next level. There are many plugins to choose from on the market but two of the best are Yoast SEO and All in One SEO. Both of these do a great job but for the purpose of this article, we’re going to focus on Yoast. Meta description – the meta description is your sales pitch and your way to help entice searchers to click on your page over your competitors. This should be enticing and engaging. If you’ve got this far then you’re already in a good place and have done a lot to help your website get great rankings. However, the next steps can help take your site to the next level and ensure that it is setup for SEO success. Good news if you’re using Yoast SEO plugin as it will automatically create an XML Sitemap of your website for you. This will help the search engines to understand the structure of your website and find new web pages and posts quickly. Now that you’ve got a sitemap you need to make sure that Google knows about it by submitting it to Google Search Console. If you’ve not already setup Google Search Console then now’s the perfect time as it gives you a full range of tools to help make sure your website is working how it should be. Increasingly website load speed is becoming more of a factor when it comes to the SEO performance of a website. Out of the box, WordPress does a great job of delivering fast loading pages but one thing that has a negative impact and holds your site back is not optimising your images. Optimising your images is especially critical for helping to improve page speed for mobile users who may not have a fast internet connection. A great plugin for optimising your website images is Smush Image Compression which works on new uploads as well as existing images on your website. Help stop hackers from targeting your website by installing a security plugin to add an extra layer of security to your site. Around 20,000 websites are blacklisted by Google every week because they contain malware and a further 50,000 for phishing. You may think that your website will never be targeted but the reality is that hackers specifically look for websites that could be vulnerable. By installing a simple security plugin you can make your website a lot less viable option for hackers to attack. For ease of use, we recommend using All In One WP Security which gives a raft of options from locking down your filesystem and database to providing Brute Force, Malware and Spam protection. Other protection includes changing the default WordPress admin panel login location and requiring users to have strong passwords. These are the basics to setup your website for SEO success and help to ensure that your website gets the results you want. Of course, you also need to make sure that the content on your website is optimised, you get good quality and relevant links to your site and that you link to your pages to help direct users and search engines.